Well this year, I decided that I’m going to ring in my new year celebrating me the way I want to be celebrated. No more wishing someone else did it for me (you’re welcome honey). I’m going to be intentional about showing myself some love and in the process I will take the stress off of my amazing hubby and make the day enjoyable for everyone! All of these ideas are simple, fun and cheap! So let’s celebrate! 1. Step Away From the Scale! Do yourself a favor and just don’t. I have this nasty little habit of weighing myself every.single.day. sometimes multiple times. It has never produced great joy, in fact, it usually produces such disappointment, anger and a need for therapy that I have to wonder why I continue to do it. So for today, your day, just walk away. You are beautiful, loved and perfectly you – a scale cannot affirm or deny your beauty – strip it of it’s power today (ahem, every day) and feel the freedom of loving yourself just the way you are. 2. Turn up the Music! Hop onto Amazon, Spotify, iTunes – whatever your music collection programming choice and make a playlist of all your favorite tunes. At the top of my list you will find, The Power of Love by Huey Lewis and the News, add in some country tunes, a little John Denver, Bruce Springsteen, 80s hits and a smattering of every other genre and you’ve got the perfect recipe for lifting my spirits. Best of all, it’s free! Grab your headphones, turn up Alexa, roll down the windows and dance to the beat of your drum! All of us will find ourselves missing someone on our birthday. Maybe it’s a loved one who’s passed on or a friend who lives far away, whatever the case, embrace their significance in your life. I miss my dad who’s been gone almost 25 years, so I make sure and pause for a moment and think of him. Yes, for a moment I might feel sad but I make sure to not stay there – wander through memories until you find one that makes you smile. These people are special to us because they helped form us and make us who we are, what better day to remember and honor them than on our birthday? So raise a glass, say a prayer, light a candle, be grateful for the time you had and let your heart overflow with love and memories. Nothing says celebrate quite like a bunch of balloons. I love them, they’re pretty, fun and their sole purpose is to make you smile. I went out today and picked out 7 balloons for right around $10 – they’re the perfect shade of pink and ivory and they just make me smile. Mission accomplished. Or the cookie, or the pie, or the ice cream or the root beer float – whatever it is that makes you close your eyes and say ‘mmmmm’ just do it. Enjoy every single bite, sip and sniff of that special treat. No guilt, no fear – simply savor and enjoy. You can go back to your diet tomorrow but today, it’s all about filling each moment with the things that bring you joy, and sometimes cheesecake is the very best kind of joy. This one may seem odd but I believe it’s a good exercise in accepting yourself and remembering all the reasons why you should celebrate you. Find time in your day, be it first thing in the morning with your steaming cup of coffee or last thing at night before you crawl into bed and write yourself a birthday card. What do you write? Well, what do you tell your friends when you write them a card? You remind them of all the things you love about them, how special they are and how grateful you are to have them in your life – why should your note to yourself be any different? Reflect on the year, in what ways did you win? In what ways did you find opportunities to grow? What about the year to come? What do you want to accomplish? What fun thing do you want to check off your bucket list? Affirm yourself and your dreams, thank God for the life He’s given you, ask Him for the strength to live it well and then seal it up and tuck it away until next year. How fun it’ll be to look back in a year and remember where you’ve come from and where you hoped to be headed. 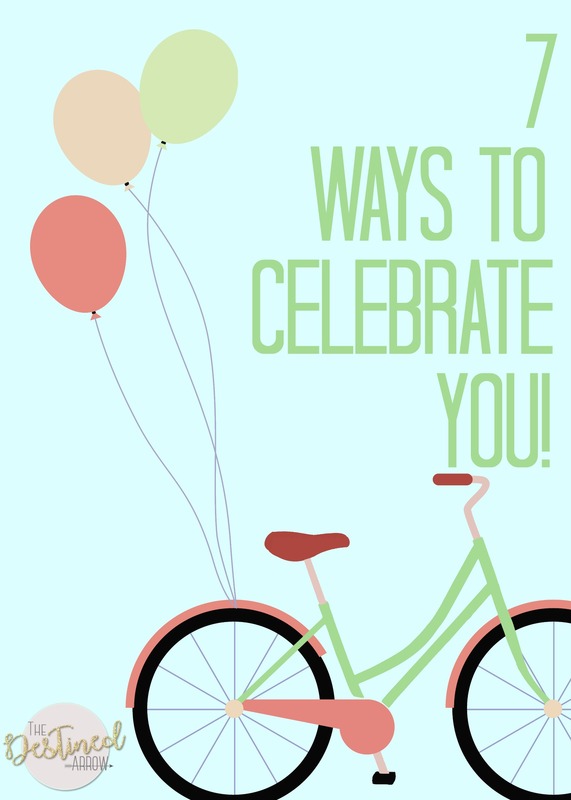 I am certain there are a million more ways we can celebrate ourselves and I hope you find them and do them! We spend so much time beating ourselves up, wishing we were different or flat out ignoring who we are that taking one day to embrace ourselves is not only necessary but should be required. Never leave your happiness in the hands of someone else – choose to make a big deal out of you because you are! And when those special loved ones and friends celebrate you in the way they choose, it will be perfect and will add to the beauty that you’ve already created. Happy Birthday Friend!